Pups who have lost their lives. My life will never be the same without my loving girl and companion. Rest In Peace my angel girl.... Rest In Peace. I am so very sorry for your loss. To me there is nothing worse then losing a pet (child), they are ours from a few weeks old. 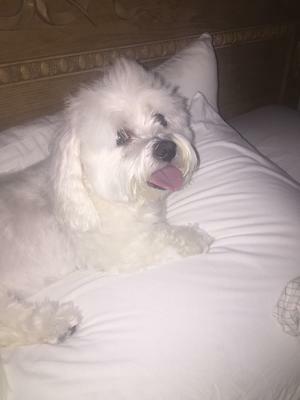 I know that Maddie loved you with everything in her little Coton heart and she had a good life with you. Know that she will be waiting for you (a long time from now) to reunite under the rainbow bridge). I hope that eventually you will be able to open your heart again. Reading over my post from last week - I see a lot of typos - so sorry, I think I was writing the post while crying. It has been a most difficult week, just going through the grief and the awful realization when you foget they are gone, as I did the other day while in Publix, I went down the pet isle to get her a bone that she loves....heartbreak all over again. I thank you all for your sweet words and for reading my post. 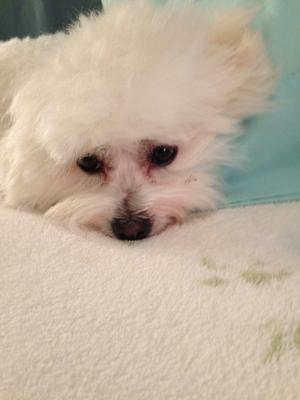 For now, I am going to unsubscribe from the Coton de Tulear website to heal and maybe at some point I'll re-join. I wish each and everyone of you all of the love and happiness with your beautiful babies. I'll miss the angel forever, so in closing I'll just say I'll see you later and not goodbye. I do not know you or your family. I do know of the feeling felt with such a loss. 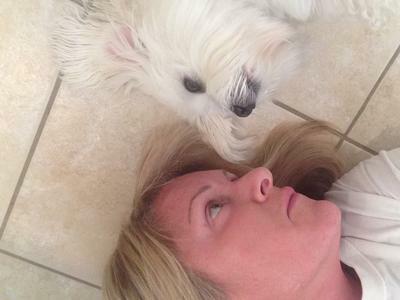 I've recently have been blessed with finding or being found by a treasured Coton De Tulear. He will reach 6 months this coming week. After adopting him into my family since February 13, 2019 I have a hard time seeing my life without his sweet endearing personality apart of it. Cancer is one of the harshest enemies of all living beings. Stealing the life out of many of its victims. The one thing it can not take with it is the many wonderful memories we have been giving while our loved ones were with us. Just had to tell you how sorry I am for your loss. Its so very painful to lose a pet we love so very much. They become such an important part of our lives and when they are no longer with us, it leaves such a big hole in our hearts. Always remember the beautiful home you provided for her and how lucky she was in life to have you. We are so sorry to read about Maddie. Our hearts go out to you. These special dogs are the loves of our lives. We know this will be a difficult time for you. Bless you. I’m so sorry for your loss, and hope you can find comfort knowing that you gave her a beautiful life in your home. My heart bleeds for you and for poor little Maddie. I have a 2 year old, Bijou is her name, and she is my life line after 21 years of widowhood. I cannot imagine life without her and so understand your feelings of sadness. Sending you my best wishes. Join in and write your own page! It's easy to do. How? Simply click here to return to In Memoriam.